Sydney based A.E Goodwin Ltd became the local licensee for the American Locomotive Company (ALCo), based in Sydney. While the Commonwealth and Victorian Railways started their dieselisation projects with General Motors products, the first mainline diesel locomotives in NSW would be the 40 Class, a more or less “off the shelf” ALCo RSC-3 manufactured in Montreal, Canada. The first “locally built” ALCo products would be the six members of the 43 Class, introduced in 1952. One of ALCo’s greatest successes would be the 44 Class, manufactured by A. E Goodwin Ltd. Of course, the NSWGR were not the only company to order ALCo products from A. E. Goodwin Ltd, some of the classes still in service today are outlined below, along with links to galleries of the class. The last locally built ALCo locomotives would be the 80 Class, built by Commonwealth Engineering and introduced in 1978. After brief experiments with smaller diesel loco classes (40, 41, 42 and 43 classes), the NSWGR made an order for ten ALCo DL500B “World Series” double cab diesel electric locomotives from A. E. Goodwin Ltd (St Marys, NSW). The class would be classified as the 44 Class, early success combined with their popularity with crews saw the order increased to a total of sixty units by 1959. A second order for more 44 Class was made in 1964 for a further 40 “Mk2” units, bringing the total class size to 100 units. The 44 Class would be withdrawn from government service by 1994, although they would soon re-enter service in private and commercial ownership. A number of units are owned privately, and used on infrastructure work in the greater Sydney area, while a handful of units are also in service with Independent Railways of Australia and P&O Trans Australia (owned by Qube Logistics). The 48 Class were A. E. Goodwin’s response to a NSW Government tender for twenty branchline diesels in 1958. A further ten units were ordered in 1960, followed by another fifteen units in 1961. The first forty-five members of the class are referred to as “Mk1” units. Based on the success of these first class members, another forty units were ordered in 1963, to be known as “Mk2” units. The NSWGR ordered another forty units in 1965 (Mk3), with a final forty 48 Class ordered in 1968 (Mk4), ensuring the class totalled 165 locomotives. 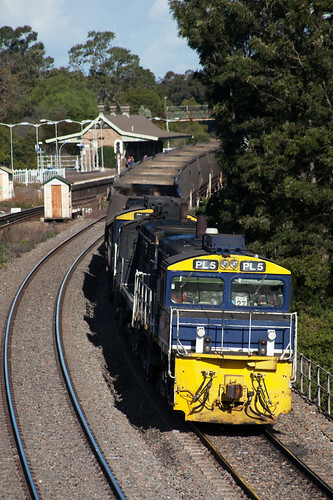 Seven 48 Class locomotives were converted to PL (PortLink) class in the late 1990’s, specifically for push-pull container trip trains in the Sydney metropolitan area, although the class is arguably better known for recent work on coal trains in the Newcastle area. For more details on the PL Class, see below. Many of the Mk1 48 Class were withdrawn in the 1990’s and sold to private operators, although the remaining members of the class were included in the sale of FreightCorp to form Pacific National. The surviving Mk1 members of the class are split between Junee Railway Workshops and Engenco (formerly Coote Industrial) for lease service, while RailCorp maintains 4819 and 4827 for shunting and infrastructure work. The remaining surviving locos from the Mk2, Mk3 and Mk4 groups are split between Pacific National and GrainCorp. A number of Mk1 units are also preserved with various groups. A total of forty four 830 Class were built by A. E. Goodwin for the South Australian Railways between 1959 and 1966. Based on the successful DL531 model built for the NSWGR as the 48 Class (see above), the 830 Class were saw use on the narrow, standard and broad gauge traffic in South Australia. As well as South Australia, a number of members of the class were relocated to Tasmania under the direction of Australian National, although this did not prove to be a successful move, with most of the class returned to SA or scrapped in Tasmania. AN also modified a number of the class to be suitable for Driver Only Operation (DOO) to improve the efficiency of shunting and trip train working (with the modified units being called the “DA Class”). Two of the class were sold to Silverton to compliment their existing fleet of similar DL531 units (see below), while the remainder of the class were sold to Australian Southern Railroad (now Genesee & Wyoming Australia) in the late 1990’s. Today, the surviving members of the class are split between G&WA and Engenco, while three former ATN Access units are owned by Pacific National, while 852 (formerly owned by QRNational/ARG) is now in the care of Junee Railway Workshops for eventual lease service. An additional order for three DL531 locomotives was placed by the Silverton Tramway Company in 1960 to dieselise their narrow gauge line. “Class leader” 27 would be sold to South Australian Railways in 1970 and renumbered 874. The unit would then pass into AN ownership, then be sold again to ARG and be rebuilt for DOO as T01. T01 would later be sold to G&WA, at which point it returned to South Australia, renumbered as 907. The other two units would remain in Broken Hill under the ownership of Silverton, even when the operator began hauling freight services to/from the Sydney area. When the Silverton business was taken over, first by South Spur Rail Services, then Coote Industrial, the locomotives remained a Broken Hill fixture. While under Silverton ownership, the pair were renumbered with a “48s” prefix in line with Silverton’s purchase of a number of NSWGR Mk1 48 Class in the 1990’s. 48s28 is now in lease service with Engenco, while 48s29 is in storage. Silverton DL531 Photo Gallery – Coming Soon. Mechanically very similar to the 44 Class, the forty members of the 45 class were ordered from A. E. Goodwin in 1961. The 45 class would see service across the state on freight workings, with the occasional foray into passenger train haulage. The class was withdrawn en-masse in 1994, although a handful survived into private ownership. 4503 and 4514 (the latter retaining the NSWGR Indian Red colour scheme until withdrawn) saw periods of service with Patrick Portlink before the operator closed down its NSW operations. 4503 was transferred to PN Bulk for use on Manildra feeder trains in Parkes. 45s1, a former Silverton unit is now owned by Engenco and available for hire to various operators for service. 4537 was rebuilt in 1995 for BHP Coal service, with the short hood lowered to improve visibility for the crews. Renumbered 103, it is currently in service in South Australia with Patrick Portlink. As the 830 Class were a follow on from the NSWGR 48 Class, so too were the 600 Class a copy of the 45 Class model. Unlike the 830 Class before them, the 600 Class were ordered specifically for standard gauge traffic. After an initial order for two units, a further four were ordered making for a total of six locomotives numbered 600-606. 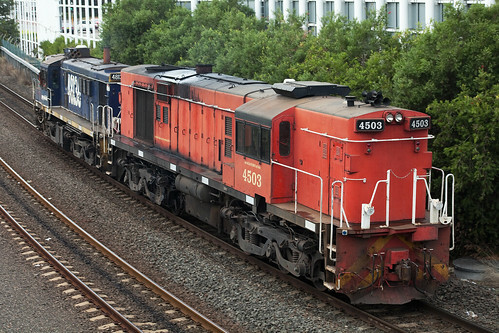 During the 1990’s, as part of Australian Nationals modernisation program, four of the class were sold to Morrison Knudsen Australia and rebuilt into cab-less, engineless (the engine room was filled with cement to increase the weight) tractive-effort booster units to be used with the ALF Class. This experiment ultimately failed, with the four units being scrapped. 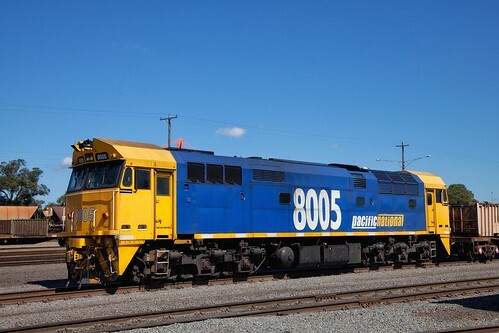 The other three (602, 603 and 607, formerly 600) passed into the ownership of Australian Southern Railroad after the breakup of AN. ASR then sold the units to South Spur Rail Services, which was taken over by Coote Industrial (now Engenco). The units are typically used as additional (trailing) motive power on P&O Trans Australia freight trains, rarely leading unless required. All three units (unlike many other Coote Industrial locomotives) still carry their last colour scheme, in this case a faded Australian National scheme. A total of forty 442 Class were ordered by the NSWGR in 1970 from A. E Goodwin to replace the aging 40 Class locomotives, which were accepted as a trade-in on the first twenty 442 Class, with a number of 40 Class parts reused in the new locomotives. During construction of the class, A. E. Goodwin announced their closure, with Commonwealth Engineering taking over construction of the class as it was the new representative for ALCo in Australia. While only one of the class has been preserved (44211 with the Rail Transport Museum), a number of the class continue on in private ownership. None of the Commonwealth Engineering build models survive, with all five being scrapped over the years. Displaced from service by the 82 Class, the locomotives were sold off in 1994 to private operators, including Great Northern, Silverton, Austrac and Morrison Knudsen Australia. 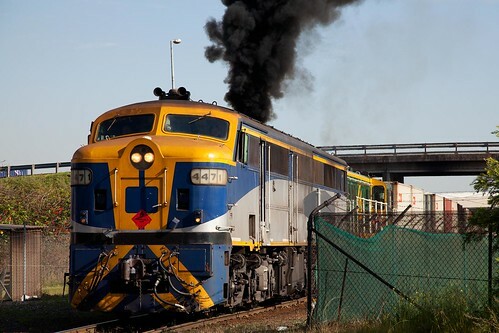 The Great Northern locomotives passed into CFCLA ownership following their collapse, as well as the former Austrac locomotives, with 12 of the class rebuilt into GL Class locomotives (see the GE Page) by United Goninan at Broadmeadow. The other four members of the class in CFCLA ownership were briefly known as the JL Class, although all have since been renumbered back to their original designations with two being subsequently sold to Southern Shorthaul Railroad for use on coal and infrastructure trains. The remaining operational members of the class were renumbered by Silverton to the 442s class before being taken over by South Spur Rail Services. These units then passed into Coote Industrial (now Engenco) ownership following their takeover of SSRS. 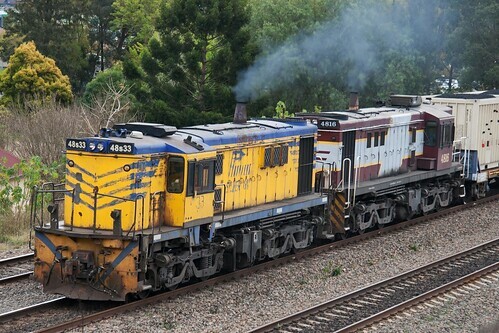 One unit (442s4) was sold to Qube Logistics as part of the sale of SSRS, with the locomotive repainted into the Qube livery and renumbered back to 44202. Morrison Knudsen Australia planned to rebuild their twelve units into single-ended EMD units, although this ultimately failed. The class did enter service (as the RL Class, see the GM/EMD Page), although only a handful of units retain any former 442 Class parts, with the majority of the class new build locomotives. 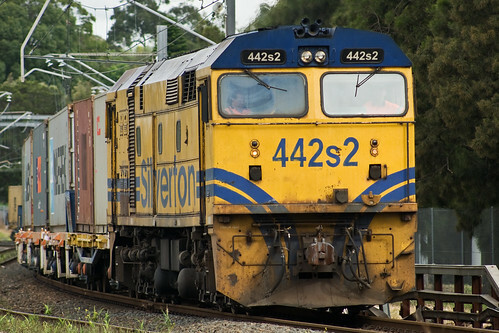 442 Class Database (on Railpage Australia). When the NSWSRA (at the time part of the NSW Public Transport Commission) put out a tender for the construction of thirty mainline diesel locomotives, they accepted the submission from A. E. Goodwin’s successor – Commonwealth Engineering. “Comeng” was offering a modified version of the 442 Class delivered in 1971. Despite having an improved engine and better traction motors, the class were built with a similar cab style to the 442 Class to standardise maintenance of the two classes (The same cab design used for the 80 Class would also be used in the construction of ten electric mainline locomotives – the 85 Class). The order would later be increased to total fifty units, with the final unit entering service in 1983. Despite only fourteen members of the class being scrapped, the locomotives that were once the pride of the fleet of the SRA are now relegated to far lesser duties in private ownership. 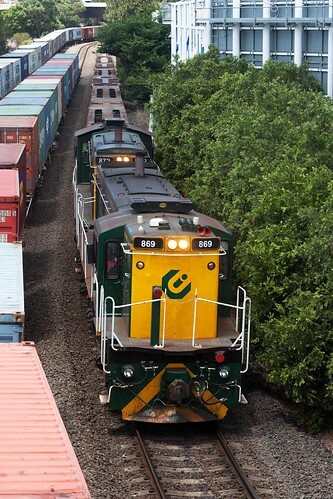 The class are split between Pacific National and Engenco (formerly Coote Industrial), with three units recently included in the sale of South Spur Rail Services from Engenco to Qube Logistics. While the Engenco and Qube units often see mainline service on a variety of workings, the Pacific National units are mostly used as shunters, with a handful used occasionally as trailing units on grain, ore, garbage and cement working. A large number of the class (both Pacific National and Engenco units) are in storage in locations including Parkes, Broken Hill and Werris Creek. Seven 48 Class locomotives were rebuilt by FreightCorp between 1998 and 2001 for use on metropolitan trip train workings to/from Port Botany. The primary modification made was the lowering of the front hood to allow full-width windscreens (similar to those used on the 82 and 90 Classes) to be installed. The class were used in push-pull configuration, with one on each end of a rake of container wagons to minimise shunting at both the port and the container yards (many of which had no run-around facilities, or had points facing away from the intended direction of travel). The PL Class would be relocated under Pacific National ownership, with PL1 and PL2 moved to Adelaide to shunt the Great Southern Rail terminal at Keswick (with PL2 later returning to NSW). The remainder of the class were assigned coal haulage duties on the lightly laid former South Maitland Railways line to Pelton (near Cessnock), although they have since been displaced from these duties by EL Class following an upgrade by the lines owners. Aside from PL1, which remains the Keswick Shunter, the rest of the class is in storage (PL4 being at Narrabri West, with the remainder stored in a cripple siding at Kooragang Island). Due to unreliability, and their large windscreens being a target for rock-throwers (thus, making them rather unpopular with crews), it is unlikely that the units will re-enter service in the future. PL Class Photo Gallery (Coming Soon). Great work, thanks for going to all the time and effort in doing this. I stand corrected but your comment re the 80 class cab being the same as the 442. I have to disagree in that the 80 cab is more rounded than the 442. I think what you meant to say was that the 80 class cab was the same as the 85 class (electric) cab. John – thanks for taking the time to comment! I’ll correct the wording of that (blame a lack of proof reading on my part) right away. Never be afraid to nitpick, we all research websites and books to gain our knowledge, and if we don’t ensure the correct information is out there, then what’s the point in learning?